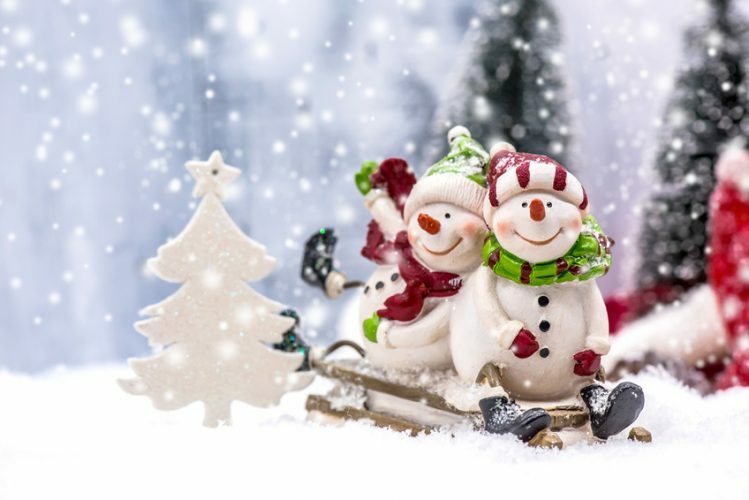 Christmas is such a magical time for children; family time, holidays, decorations, yummy food and of course presents, what could be more fun! We have a variety of great ideas for your home and under the tree this year. Whether it be the one-of-a-kind Loving Family Holiday Themed Dollhouse, or an enchanting dollhouse for your little prince or princess, or perhaps a Christmas nativity scene, we’ve got you covered! 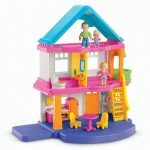 Being so interactive makes a dollhouse a wonderful Christmas gift to keep the little ones entertained for hours on end. They last for years and many are built so life-size these days bringing a real sense of comfort and home to children. These mini houses are suitable for all ages from young toddlers right through until the early teens. Here are some of the most popular for all ages that are sure to dazzle your little one this Christmas, and for years to come. 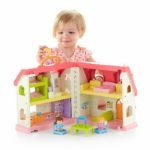 Fisher-Price Little People Surprise & Sounds Home 1-5yrs - 50+ fun sounds, songs & phrases! KidKraft Majestic Mansion 3-7yrs - best seller! 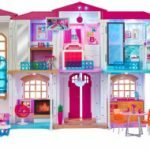 Barbie Hello Dreamhouse 3-7yrs - a 2-story digital smart-house! - the dollhouse literally comes alive! While a dollhouse is a great gift for your child for any special occasion, one with a festive theme is ideal for Christmas. There are plenty of dollhouses for kids to choose from, but very few have a special Christmas theme. Here is our review of the Fisher Price Exclusive Holiday Dollhouse which can really set the Christmas scene at your house. Both interactive and decorative! The Fisher-Price Loving Family Exclusive Holiday Dollhouse is the perfect Christmas dollhouse. It has six rooms over three levels and comes complete with 50 accessories, including Christmas dollhouse furniture. The reversible décor means that your child can create a festively themed dollhouse for Christmas and then revert to a normal dollhouse for the rest of the year if they wish. 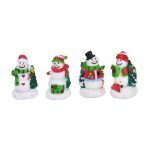 Some of the holiday accessories include a dollhouse lighted Christmas tree that plays songs, Winter candle window boxes, a twinkling wreath and a fireplace that lights up and plays songs. The Christmas accessories are not the only interactive feature of this dollhouse as other elements of the house also make sounds. These include a whistling kettle and a sizzling stove-top. The dimensions of the dollhouse are 19 x 16 x 26 inches and it weighs 24.6 pounds. Q. Is the dollhouse suitable for year-round use? A. Children can have lots of fun converting a normal doll house into a Christmas house filled with festive accessories. 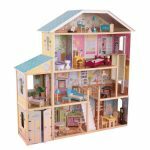 The reversible elements mean that your child will not just see this dollhouse as something to play with at Christmas; it is a toy suitable throughout the year. Q. Does it come with accessories? A. 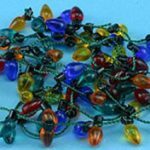 It is possible to buy additional Christmas accessories and furniture for any dollhouse, such as a tree set, lights, etc (see below). However, with this dollhouse you do not need to make any additional purchases as everything you need is already included. The interactive elements of this house are one of its most appealing features and will add to the fun your children have when playing. The lights and sounds will keep your child interested and give greater options for them to act out real-life scenes. 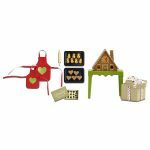 The Fisher-Price Loving Family 2 in 1 Seasonal Room Set is the perfect addition to the Holiday house. A. It is worth noting that you do need to buy batteries to make these features work. The dollhouse requires 5 x AAA and 2 x AA batteries for the lights and sounds. Q. Who is this dollhouse suitable for? Another bonus mentioned by people who have bought this dollhouse is that it is gender neutral. Many dollhouses are decorated in pinks and lilacs and customers complain that their sons want to play with a little house but the ‘girly’ colors put them off. 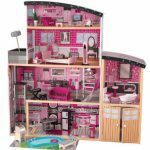 The Loving Family Exclusive Holiday Dollhouse has a neutral color scheme that will appeal to both boys and girls. The Fisher-Price Holiday Dollhouse is possibly the best dollhouse available that has a special Christmas theme. The majority of the reviews of this product are excellent with most people rating it as five stars. Overall, this dollhouse is fantastic, not just at Christmas but at any time of the year. It has excellent features that will provide children with hours of fun! 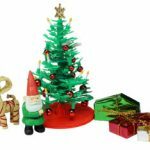 Here are some popular Christmas additions to add to any doll house, including a tree set, Christmas lights, snowmen, and a gingerbread house set! So cute and an easy way to bring the festive season into your home. 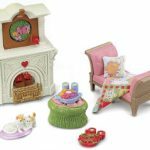 Affordable dollhouse decorations fit for any kids play house. 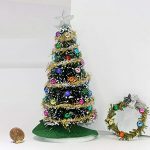 Add extra festivity to your dollhouse with this Christmas tree and wreath. Fisher-Price have an abundance of fun and interactive toys for your little toddler this Christmas. Great for both boys and girls. Choose from musical train sets, Christmas playsets and a Christmas Village! These affordable interactive toys will have the whole family engaged and entertained over the festive season. Now it’s just a matter of deciding which one! The Wikipedia definition of a nativity scene is: the special exhibition, particularly during the Christmas season, of art objects representing the birth of Jesus. Nativity scenes are a great way to celebrate Christmas visually and interactively. Especially fun and educational for young children who often learn better using their physical senses. These scenes often have objects that can be moved around to make play more fun. Some even play carols! Lovely ornamental-style scenes that can be cherished and enjoyed by the family for years to come. All sizes and price tags to choose from. Christmas is a special time for families and a great opportunity for spoiling your loved ones! 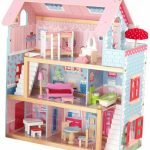 If you have children then a doll house can be a fun, interactive, and even an educational gift, that can keep your little ones occupied from toddler right through to early teens. 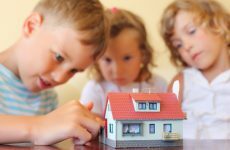 We have reviewed some of the best brands of dollhouses to help you make the best choice for your family. To see all types and styles of dollhouses for both boys and girls click here!